Robert Tynes has been painting professionally for over 30 years. He has held over 25 solo shows and been included in over 150 group exhibitions. Tynes is currently Professor of Art at the University of North Carolina, Asheville where he has been for the past 24 years. Prior to moving to the Asheville area he taught at the University of Hawaii, Humboldt State University in California, and at East Carolina University’s School of Art. (like collage or assemblage) to the surface of abstract paintings. 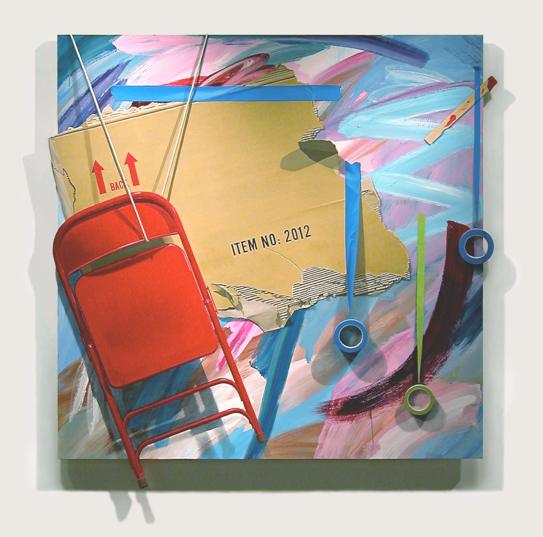 Back Up Plan, 2008, acrylic and oil on birch panel, c. 60 x 60 inches. Please feel free to view a portfolio of images of artwork through the links at the top of the page. There are also links to an Artist’s Statement, Bio, Résumé, CV, etc. All works represented on this site are copyright protected by Robert Tynes, 2013, and may not be reproduced without written permission.